The detector of the electromagnetic field, provided with the function of detecting the signals of the mobile GSM communications. • Detection of the mobile telephones and other means of the secret radio communication in the premises, where the examinations are held, and in the lecture-halls. • Detection of the mobile phones and other non-sanctioned means of radio communication at the territory of the corrective-labor institutions. • Detection of the mobile communication means among the personnel with the restricted rights for communication. • Search and localization of the installed and worn next the skin radio microphones, telephone re-transmitters, video transmitters, radio-range beacons, radio-electronics neutralization means and other radio transmitting devices with different types of modulation in the wide frequency range. 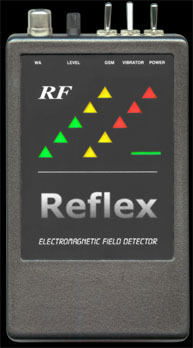 • Wide-band detection of the electromagnetic field. • Ten-segment double-regime LED indication of the signal level with the automated attenuator. • The highly-sensitive system of detection of the signals of the global standard for mobile communications GSM 900 and 1800 MHz, provided with the short-term memory. • Sound-wave notification and vibroringer. While staying in the on-duty regime, the device reflects the weakest alterations of the level of the electromagnetic field; besides, the LED indicator functions in the regime of the cursorial dot. When the level of the electromagnetic field exceeds the maximal value of the indicator, staying in the on-duty regime, the attenuator switches on automatically; besides, the light-emitting indicator turns to the regime of indication in the shape of the increasing column and the user is notified either by the sound signal or by the vibroringer. The user is provided with the possibility to alter sensitiveness of the detector, to select the way of notification and switching off the function of reacting towards the weak signals of the remote mobile phones of the GSM standard. The internal antenna is used for detecting the mobile telephones, whereas the external antenna may be switched off. The communication devices, attributed to the standard GSM 900 and 1800 MHz, can be detected while realizing the communication and at the moments of switching the service on; the memory indicator continues to illuminate within 60 sec. after making play. Remoteness of detection depends upon the radiation power and conditions of screening of the transmitter by the outside objects. Powerful stationary transmitters can be detected at the distance, exceeding 20 meters. The collateral radiations of the domestic electric appliances can be detected at small distances. 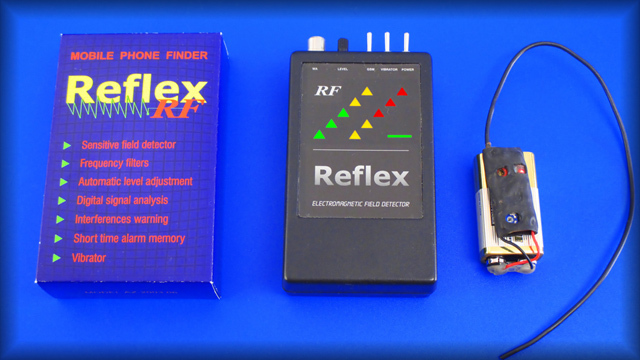 If compared with the system of neutralization of the means of communication, no permits for application of the searching device Reflex RF are need.